White Medium Weighted Canvas Dummy by RRT. $7.50. Today we're looking at the white medium weighted canvas dummy by Specialty Products. Specialty Products are the folks that make the Retriev-R-Trainer. They make a line of dummies. I've enjoyed this one. It's a little heavier canvas than some of the ones that we have. It's a little pricier. But you've got a couple of different things. It's got a grommet and it's stitched, so it's going to hold up a little bit better. They also add some weight to it. So it's a little bit heavier than some of the canvas dummies that are on the market. The idea behind that is that you can get a little more distance out of it when you are throwing it. Canvas dummies are not for everybody. They have a more natural feel, and so some folks like them. The biggest thing you've got to keep in mind with a canvas dummy is that you've got to take care of it a little bit better. It's not like a plastic dummy; you can't just leave them wet and let them just hang out anywhere. You've got to dry them. You've got to clean them occasionally. So it's one of those things where the folks that use canvas have to work at it a little bit more. But some dogs prefer it. It's just more of a natural feel. And if you are looking for a high-end canvas dummy, the weighted medium white dummy is a good way to go. Specialty Products, they make really nice gear and this is one of their standards. We've enjoyed them and we recommend them highly. 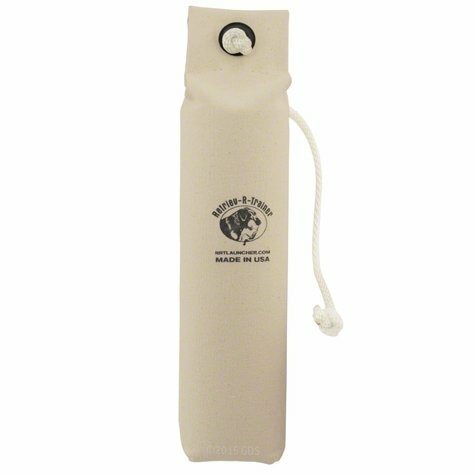 My lab's best friend.......this canvas dummy is awesome for training your retriever for upland or duckshooting. 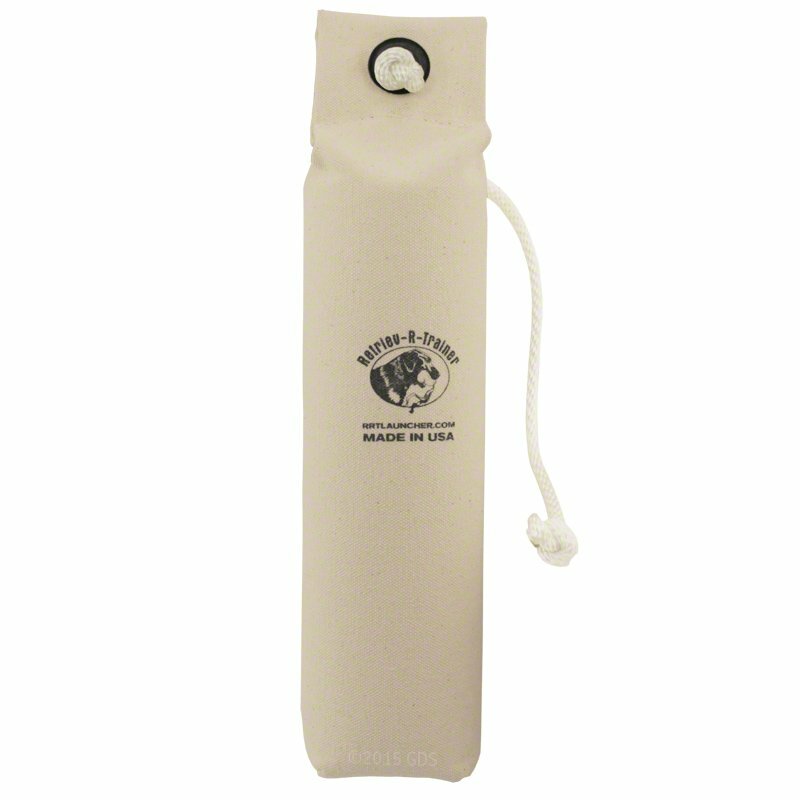 The size, weight and canvas material give the K9 a good feel for hunting situations. Canvas can be douzed with pheasant or other scents. Only drawback is no good on water retrieves. german shorthaired pointer. Hunts. Family pet. I am not a trainer but this is what I was looking for as far as durability, texture, and pliability. My dog is five and is incredibly intelligent and she gets very excited when I take it out to work with her. I wish I had seen the dove trainer and would have got that first, had I seen it. She is doing fine with this. It's what I was looking for when I bought it. Price is fair, shipping quick. Good deal. This is the perfect dummy for my 1 year old Britt. The overall quality is excellent. You can tell it was made in the USA. Just like the rest of the products I have purchased from Gun Dog, it's excellent. She loves the canvas dummy. It's a great training aid. Just the right weight and size for her to confidently retrieve! "As all of our retrieves are water based, they float well and throw well." I have used Hallmark (excellent) and Remington (not so good). The RRT dummies are as good as the Hallmark. As all of our retrieves are water based, they float well and throw well. "This dummy is durable and a great weight for the young dog." This dummy is durable and a great weight for the young dog. "As expected, good quality bumper." As expected, good quality bumper. "This one is perfect, and she LOVES bringing it back." We're training our pup to retrieve. Being a medium sized breed, we were unsure what size dummy to order. This one is perfect, and she LOVES bringing it back. Now let's hope we can transition to birds easily. "Good sturdy construction. Gets dirty." Good sturdy construction. Gets dirty. "I am very impressed with the thickness and quality of the canvas." I ordered a few of these to help with sent stations and retrieving. I am very impressed with the thickness and quality of the canvas. "Much better than plastic dummies which my dogs destroy quickly." Elderly pet and service dog pup love to retrieve this. Teeth punch holes in the cover, but it doesn't tear. Machine washable. Much better than plastic dummies which my dogs destroy quickly. Great product and delivered as promised. Perfect for training. I opened the box and went right to work. "Your service is the best! Love the dummies. Great for the young dogs." Your service is the best! Love the dummies. Great for the young dogs. "They work well on both water and land and are very sturdy." I have used these 3 inch dummies for many years, and they are excellent! They work well on both water and land and are very sturdy. Good weight for throwing. Canvas is soft on Ike's mouth. A classic. "The attached rope is perfect for throwing. I highly recommend it. It fits well in my dog's mouth, and he loves carrying it back to me." I love my medium weighted canvas dummy. It is very sturdy and well made. It is just the right weight to be able to throw a very long way. The attached rope is perfect for throwing. I highly recommend it. It fits well in my dog's mouth, and he loves carrying it back to me. These are very high end canvas dummies . Nice size and weight, but the new thinner ropes are not good. A hard toss pulls the rope through the eyelet. "Great, but lost the cord"
The dummies are great but one of the cords for throwing has already come off and gotten lost. It could be a little heavier for further throwing distance. The rope is too small diameter. It's so small even with the knots in it, will pull through the eyelet. I ended up making my own rope which was larger diameter. "My only complaint is that this dummy is not as heavy as I would like." My only complaint is that this dummy is not as heavy as I would like. Thin cover, and thin rope. Last bumper lasted 2 years. This lasted two days (used for training, not offered as a chew toy). Ideal for introducing your dog to the sport of retrieving and also aid in advanced training. RRT's Throw Dummies are ideal for introducing dogs to the sport of retrieving and also aid in advanced training to teach your dog to retrieve doubles. Free Throw Rope included with every dummy!